Creating relevant, sharable content needs to be part of the overall marketing strategy, as it is an important vehicle for Word of Mouth advertising. A recent study from Chadwick Martin Bailey and iModerate Research Technologies found that close to half (49%) of consumers share content online at least once a week, with the vast majority being shared through email (86%) and Facebook (49%). This shows that even with all the buzz around social media, email is still a key component to any online marketing initiative. Still for those 18-34 years old, the use of the two methods are already close to even while for those 35 and over, email is still the primary way they share content online (93%). 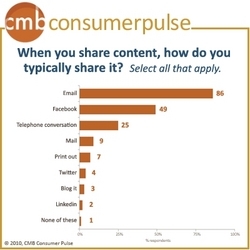 When it comes to deciding what to share, entertainment value tops the list. The research found that 72% of people share because they find something interesting or entertaining, much more than thinking about what recipients might value (58%). Give consumers a reason to laugh and you’ll give them a reason to share, 58% say they share content online to get a laugh. An executive summary report with additional findings from this Social Sharing research is available as a free download from Chadwick Martin Bailey. Data was collected from 1,504 adults (aged 18 and over) via a nationally representative online survey questionnaire within the United States by Chadwick Martin Bailey the week of August 23rd. In addition, iModerate Research Technologies conducted one-on-one discussions to more fully contextualize their social media behaviors.